The Proverbs of King Solomon are full of warnings against liars, cheaters and deceivers. That pretty well sums up the nature of today’s hackers and scammers, who hijack personal information from all kinds of sources. Tax ID theft is up 66 percent from just four years ago, and most victims don’t know they’ve been hit until a long-anticipated tax return never shows up. Along with Social Security number theft, tax ID thievery is one of the most common forms of identity theft. Most victims only realize their personal information has been hijacked after the fact, when they never get a tax refund that’s due. When they follow up with the IRS they may find that the refund has already been claimed using their tax information. And that information can also be used for other purposes such as raiding the victim’s bank accounts. 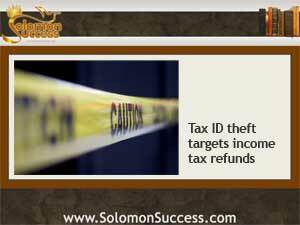 What makes tax ID and Social Security number theft so easy? The main reasons, according to fraud and cybersecurity experts, have to do with the vulnerable nature of the government’s databases, which are often overburdened and poorly protected with outdated security software that allows hackers easy access to all kinds of personal information. And because a vast network of workers are constantly updating and inputting information, the chain of processing allows for human error at nearly every point. The same kind of vulnerability plagues medical databases at large institutions such as the Veterans Administration and insurance companies. The information that’s collected often goes global, bought and sold in marketplaces around the world to create new identities for people crossing borders and avoiding prosecution. Most victims of tax and Social Security ID theft don’t know what’s happened until after the fact, so the burden of resolving the issue lies with them. Experts advise anyone who misses getting a tax refund within a reasonable time to follow up with the IRS or state tax authorities to verify its status. And if you suspect your information has been hijacked, they stress that it’s essential to report the problem to all entities such as credit card companies and banks.